More women than men attend the country’s universities, but overall the gender gap still favors the boys. 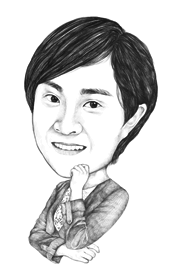 Xu Duoduo is a research assistant professor of social science and a junior fellow of the Jockey Club Institute for Advanced Study at Hong Kong University of Science and Technology. 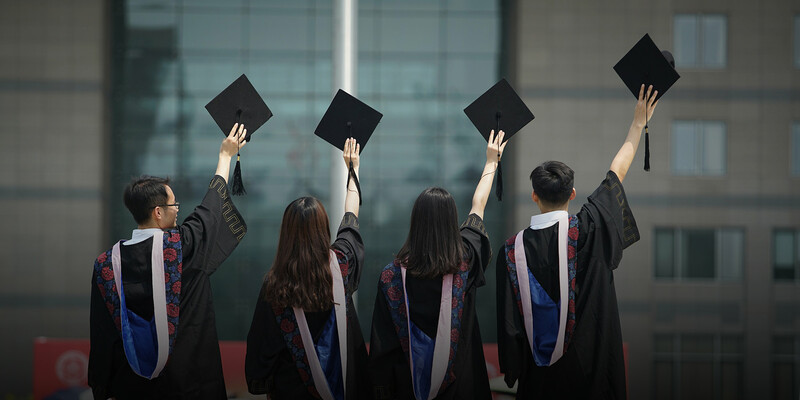 Although men have historically enjoyed overwhelming advantages in educational attainment, persistent efforts to increase women’s access to schooling and deepen understanding of gender equality are steadily shrinking China’s education gender gap. 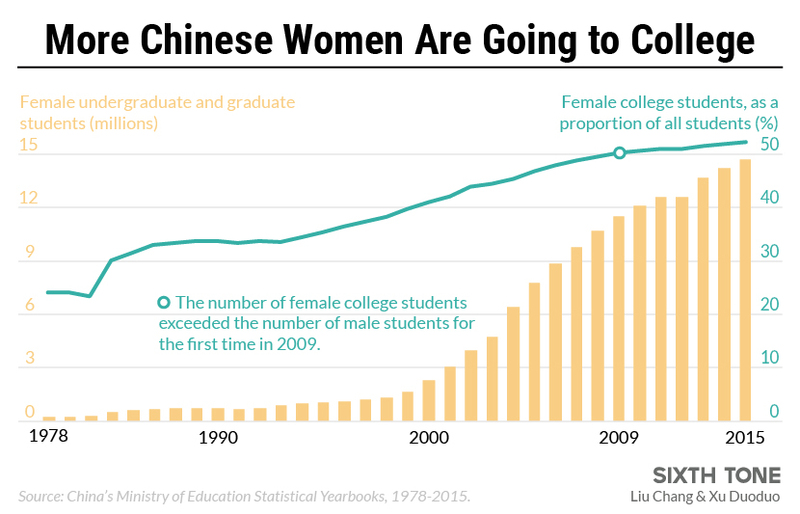 Prior to the expansion of university admissions in 1999, women consistently made up about 20 percent of students at China’s higher education institutions. After 1999, this proportion grew quickly, and in 2009 the number of female students enrolled at the country’s universities began to exceed that of their male counterparts. Yet a country’s compulsory schooling policies or its university admissions rates only tell part of the story. Gender gaps persist in Chinese higher education, as evidenced by the distribution of male and female students in various fields of study. For example, the proportion of men is much higher in so-called STEM subjects — science, technology, engineering, and math. Because these subjects lead to comparatively high graduate salaries, this trend exacerbates gender inequality. 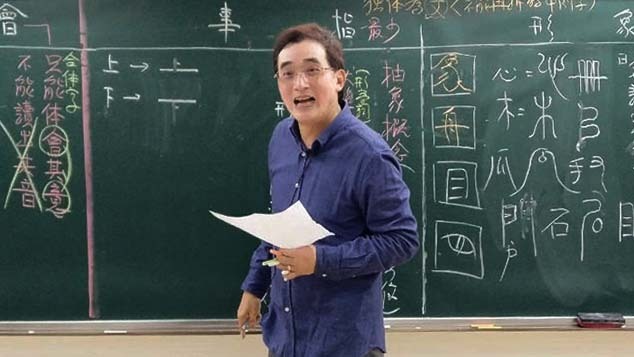 According to the undergraduate student registration data provided by Beijing Municipal Education Commission, around 35 percent of Chinese women would have to change their majors to rectify the city’s skewed gender distribution. 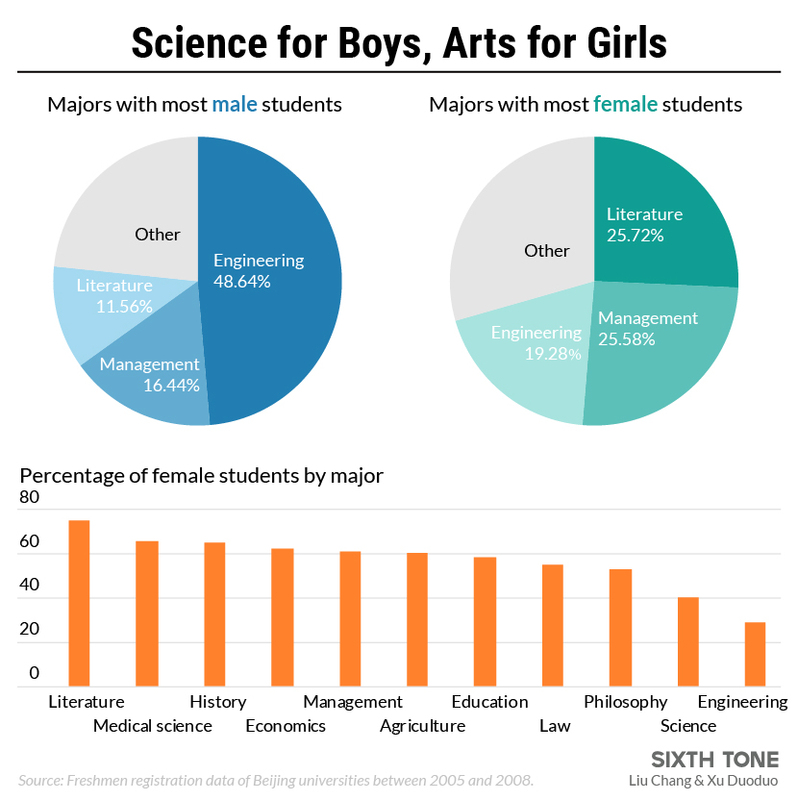 While more than half of male students take STEM subjects, women tend to choose literature, history, and other humanities majors, and they make up less than 30 percent of STEM students. Research conducted in the West has found similar results. Most sociologists agree that institutionalized gender norms play a key role in this imbalance. Stereotypes, like the false notion that men are naturally better than women at math, sit alongside traditional gender roles dictating that men should be breadwinners and women should handle domestic affairs. This phenomenon almost certainly steers women away from STEM fields and may form a vicious circle whereby students continue to conform to socially prescribed roles and choose “gender-suitable” majors. [The proportion of] female university students from wealthier backgrounds suggests that the only women to enjoy equal opportunity to men are those higher up on the socio-economic ladder. 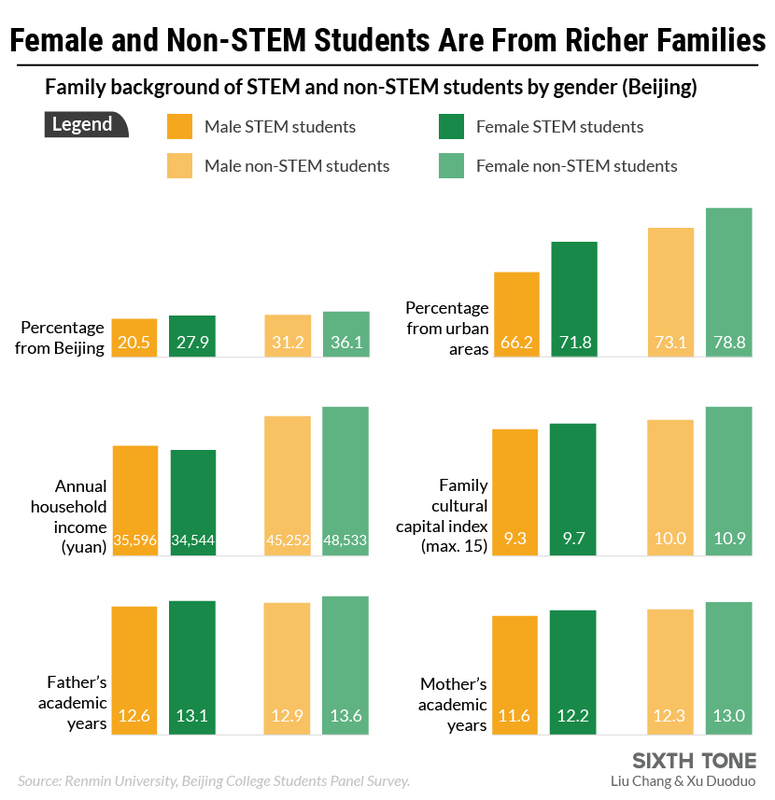 Data from the Beijing College Students Panel Survey (BCSPS) reveals another interesting phenomenon: Liberal arts students tend to be women from well-off families, while STEM students are more likely to be men from poorer households. Overall, female university students tend to come from better-off families than their male counterparts, regardless of their chosen major. According to the study, more of Beijing’s female students hailed from the city than their male counterparts, who were, in turn, more likely to come from the countryside. Female university students also tended to come from families with higher household incomes, parental education levels, and so-called cultural capital — that is to say, they expose their children to more literature, poetry, art, and other cultural artifacts. This may be because families from better socio-economic backgrounds have more resources to invest in their children’s education and are more likely to believe in gender equality. In rural families and those with more limited resources, on the other hand, the traditional preference for sons may force girls to sacrifice their educational opportunities in favor of their brothers’. But regardless of gender, liberal arts students are more likely to come from wealthier families than STEM majors. Families with lower household incomes tend to measure the value of a college major in financial terms, preferring degrees that lead to high-paying career fields, such as computer science and engineering. 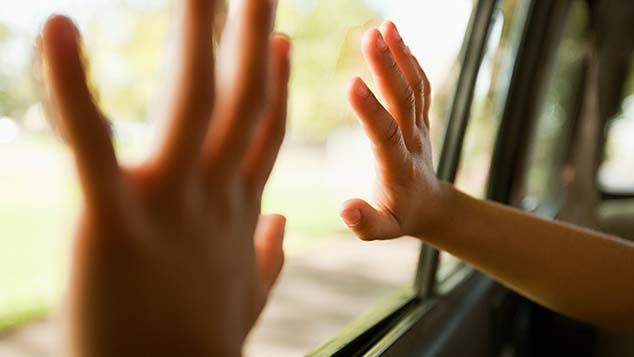 Wealthy families, on the other hand, seem to care less about the future earning potential of their children’s fields of study, probably because their household wealth somewhat guarantees that their descendants will not live in want. Children from high-income families are therefore more likely to follow their interests into fields like literature, history, or art. While we are of course happy to see more talented and intelligent women from rich families on university campuses, we also must be concerned. Where did all the poor women go? The BCSPS data also demonstrates how families with higher socio-economic status are able to give their children more cultural capital. This, in turn, allows these students greater latitude to choose a liberal arts-oriented subject that interests them, rather than having to focus on a more practical, lucrative STEM major. The tendency for female university students to come from wealthier backgrounds than their male counterparts actually reveals women’s disadvantage in education as a whole, because it suggests that the only women to enjoy equal opportunity to men are those from families higher up on the socio-economic ladder. Women from less privileged backgrounds, especially those from rural areas who experience significant gender discrimination, have far less opportunity than men from similar backgrounds to change their lives by earning a college degree. The male-female divide across majors also contributes to gender inequalities in the labor market. With many graduates from STEM programs, men enjoy higher average salaries than women. As they gain experience, men in STEM fields tend to be promoted more quickly. Add to this the comparatively greater energy that Chinese women expend taking care of their families, and the gender gap in the workplace only widens further. We must come to grips with the fact that, even though women now make up the majority of university students, China is still far from realizing gender equality in education. While we are of course happy to see more talented and intelligent women from rich families on university campuses, we also must be concerned. Where did all the poor women go? The role gender inequality plays in the segregation of certain majors will be difficult to eliminate, as it is mixed up with an internalized desire for — or at least acceptance of — the sexual division of labor. A student’s choice of major is often influenced by gender norms, but this reality frequently lies hidden behind the mask of voluntary choice. This muddled state of affairs conceals the inequalities lurking at the heart of the segregated major phenomenon. 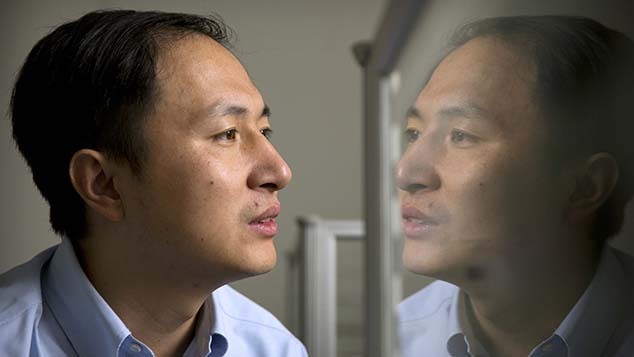 Tian Bing, a Ph.D. candidate in social science at Hong Kong University of Science and Technology, also contributed to this article.